If you only have a week in Italy, as many Americans going over for the first time do, three days in Rome and two in Venice are a good way to sample la dolce vita. So before you fly into Rome, check out Venere for your desired hotel. If you have a favorite spot, just go to it on their map and up pops all of the hotels in the area at various prices. There are also reviews so you get the latest assessments from the people who are staying there. We like to stay near the Pantheon or on the Via Cavour by the Coliseum, as these are fairly central locations. A good starting point in Rome is a trip on the Hop on-Hop off bus to get a good overview of the city highlights. You can buy the tickets in advance and get a hotel pickup if you choose to get started with the first morning run. This tour is 90 minutes round trip. Take it all the way around and on the way decide where you want to get off in the next run around. You can get off and on at sites for 24 hours. It’s a great way to get around the city that first day. There are so many things to see and do in Rome it is difficult to narrow them down. The Coliseum, the Roman Forum and the Palatine will leave a lasting impression. If you are intrigued with Roman history you can spend an entire day in this ancient area. The Forum has a wide assortment of ruins from temples to majestic government buildings and private villas. If you decide to spend time in the Forum, pick up one of the small transparency books as you walk in, the transparencies show what the building looked like in Roman times when it was fully in tact. This will help bring the Forum to life. Above the Forum on the hill is the Palatine, home to the emperors and aristocrats of ancient Rome that you can also tour. And if you prefer an indoor activity, pay a visit to the Capitoline Museums designed by Michelangelo in the 16th century; the magnificent palazzos house a fine collection of sculpture and paintings. The walk behind the museums to the Tarpeian Rock affords a fine view of the Roman Forum. This view, and that of the Palazzos, are worth the walk up to the museums even if you don’t have time to enter. In the early evening head across the river to Trastevere. If you take a taxi, the Cathedral Santa Maria Trastevere is a good destination. Try to get there before the church closes, usually around 7 pm., the mosaics are a marvel. This is thought to be the first Christian church in Rome. Trastevere is a wonderfully relaxing neighborhood in which to walk around. There are many shops and restaurants, try La Cornucopia at the Piazza in Piscinula for excellent antipasti and fresh fish, or Da Paris at Piazza San Calisto for homemade pasta and traditional dishes. There are many sidewalk cafes and restaurants to move on to for coffee or a limoncello after dinner. On day 2 head to Vatican City. This will definitely occupy you for the day. The Vatican Museums and Sistine Chapel, the Castel Sant’Angelo and St. Peter’s will keep you in awe. A good way to do this and stay out of the long lines into the Vatican Museums is to pre-book a tour of the Vatican Museums and Sistine Chapel. When you book, you can prearrange a pickup from your hotel in the morning for the 9 AM tour. After the tour you can stay in Vatican City and see St. Peter’s and the Castel if time permits. Be sure to take time for those coffees and gelati; it’s part of the Italian experience. In Italy you will find that the lunch hour is usually from noon till 3 and shops close from 1 to 3:30 or 4. They then reopen till around 8 pm. After your busy day at the Vatican take a cab for the Aventine area and a restaurant named Perilli a Testaccio at 39 Via Marmorata, have your hotel make a reservation. You will enjoy this place and it will give you a good taste of true Roman cuisine. After dinner, take the taxi to Piazza Navona, this is a magnificent piazza any time of the day but it is particularly beautiful by night. The spectacularly lighted fountains surrounded by luxurious cafes are the perfect end to your day in the eternal city. On day 3 you must head over to the Piazza di Spagna and the Spanish Steps for a leisurely stroll and some shopping on the Via Condotti. You will find a wide range of designer names and specialty boutiques, jewellery stores and home decor products. From here head to the Piazza della Rotunda and the Pantheon…what a fabulous building! The Pantheon is almost 2000 years old and it has a roof! The rich marble interior is still there for you to see the wonder that was Rome during the Roman Empire. There are a number of sidewalk cafes around the Pantheon Piazza that are great for coffee, lunch and people watching. And right behind the Pantheon is a great little furniture store called Riflessi that will give you a flavor for Italian interior decor. That will probably do it for the day since you need to catch that train to Venice. However, if you stay on in Rome or want to substitute for a previously mentioned site, you might want to visit a scrumptious Palazzo called the Doria Pamphilj not far from the Pantheon. The state apartments and art collection are wonderfully preserved and the audio tour is narrated by a family member who owns the palazzo. It’s a wonderful look into life in Rome over the centuries. Whatever your time in Rome, be sure to take the time to relax on the various piazzas and enjoy the many beautiful fountains and scenic walks. You can always save that one more site for the next time because everyone wants to return to Rome. 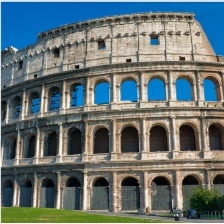 For more information on Rome, see our Rome City Tours page.